Skinned and boned lemon sole strips in a savoury lemon and pepper breadcrumb, Oven bake or Fry. Chunky skinned and boned cod strips with a tangy lime and chilli breadcrumb, Oven bake or Fry. 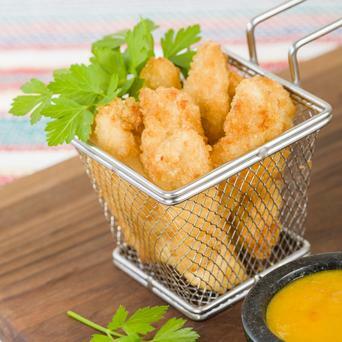 Skinned and boned monkfish strips in a savoury lemon and pepper breadcrumb, Oven bake or Fry. Succulent, Langoustines tail clusters in a deep fry breadcrumb. Premium single tail scampi coated in a light tempura batter, Oven bake only. Succulent tail on king prawns wrapped in filo pastry, Oven bake or Fry. Succulent tail on Japanese style king prawns in a tempura batter, Oven bake or Fry. Succulent tail on butterfly king prawns in a natural breadcrumb, Oven bake or Fry. Squid rings coated in oven batter, Oven bake or Fry. Cod, potato and seasoning wrapped in a natural breadcrumb. Fry or Grill. Cod, Salmon, potato and seasoning wrapped in a natural breadcrumb. Fry or Grill. Poached smoked haddock, spring onion and mashed potato in a natural breadcrumb, Fry or Grill. Prime fillets of salmon formed into nugget shapes and coated in a oven crisp breadcrumb, Oven bake or Deep fry.